Start Off 2019 with 20% Off Your Entire Order! :: Dots Diner :: Big Portions, Big Taste, Big Value! Start Off 2019 with 20% Off Your Entire Order! Well, 2019 is underway, and I’ve got to say I’m loving it so far! I always enjoy the fresh start that a new year offers, even if ol’ forgetful Dot keeps writing (and typing) 2018 on everything. (Heehee!) I’ll get it right one of these days. How are y’all doing with those New Year’s resolutions? I hope you’re sticking to them and making 2019 your best year so far. Each year, I set some goals for myself, and one of those goals always involves cooking up the most delicious food I can make for the best customers in the world. 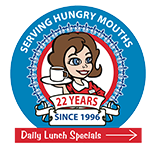 I want Dots Diner to make you feel like you’re eating at home with your momma, even if you’re not always able to do so. My hope is that every time you leave Dots, it’s with a full belly and a happy heart! To make your next dining experience even happier, I’m including a coupon for 20% OFF YOUR ENTIRE ORDER. Just print it out and bring it on in, and I’ll take care of the rest. I can’t wait to see you real soon… and bring some friends.